How Many Carbohydrates, Fats, And Proteins Should I Be Eating? Carbohydrates, fats, and proteins, are the essential macronutrients that our body needs on a day to day basis. But how much of these needs to be incorporated into your diet is a question that is confronted by children, youngsters, and adults alike. Carbohydrates, fats, and proteins, are the essential macronutrients that our body needs on a day to day basis. But how much of these needs to be incorporated into your diet is a question that is confronted by children, youngsters, and adults alike. A combined diet of the three macronutrients is required to aid in growth and development, immunity, tissue repair, and metabolism. 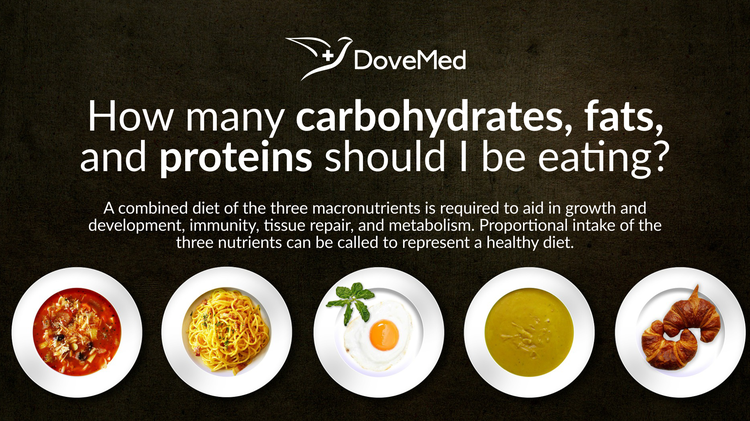 Proportional intake of the three nutrients can be called to represent a healthy diet. Carbohydrates can be classified as sugars, starches, and fibers. Sugar is available in its natural form in foods, such as lactose in milk and fructose in fruits. Fibers occur naturally in whole grains and beans. Apart from this major form of carbohydrate is consumed in the form of starch that is loaded in starchy vegetables and grains. The imbalance is due to the consumption of high amounts of added sugar, white rice, sweets, sweetened fruit juice, and soda. These types of foods do not have much nutritional value. Whole grain and fiber have high nutritional value and promote weight loss. The Food and Drug Administration (FDA) health says that whole grain products have 51% or in excess of total ingredients compared to other whole grain products. Carbohydrate has 4 calories per gram. 45 to 65% of your everyday diet should consist of carbohydrates recommends the American Dietary Guidelines, which translates to between 225-325 grams daily. It is the major energy providing nutrient. Slower acting carbs, like multigrain bread, lentils, beans, and brown rice are suggested. Proteins are made up of amino acids that help in building and maintaining the body tissues and muscles from degeneration. Protein diet can be subdivided as being obtained from plant-based products and animal-based products. Animal-based diet includes milk products, poultry, seafood and eggs. The Dietary Guidelines for Americans, 2010 recommends an intake of 8 ounces of seafood per week for young children and 20% of total intake of protein in all varieties. Plant sources include peas, nuts, beans, soy products, and seeds. Protein has 4 calories per gram. The intake of protein is essential to maintain growth and to provide energy. Protein can be stored in the muscles and the body converts it into glucose. Enzymes are also proteins that help in building new tissues. About 40 to 65 grams of protein is essential for a healthy adult every day. About 12-20% of your everyday diet should consist of proteins. Consuming a diet with much less than these quantities of protein, may lead to breakdown of muscles resulting in to stunted growth, muscle degeneration, hair fall, skin lesions, and even low immunity levels. Fats provide energy to the body. Since only 10% of the fat consumed is converted into glucose there is not much of effect on the blood glucose levels. The detrimental effect is that fats slows the digestion process and as a result can keep the blood sugar high for a longer duration of time. Fats can be divided into saturated fat, trans fat, monounsaturated fat, and polyunsaturated fatty acids. Fat is available through plant and animal sources. Saturated fat and trans fat are considered to be injurious to health. Healthy fat (such as omega-3 fatty acids) is available in tuna, olive oil, almonds, flaxseed, walnuts, avocados, and salmon. Fat has 9 calories per gram, the highest among the trio of carbohydrates, fats, and proteins. Moreover fats should constitute 20-35% of your everyday diet. A healthy diet with balanced amounts of carbohydrates, fats, and proteins, in your daily diet is vital for your body. Institute of Medicine. Dietary Reference Intakes for Energy, Carbohydrate, Fiber, Fat, Fatty Acids, Cholesterol, Protein, and Amino Acids. Washington (DC): The National Academies Press; 2002.
de Graaf, C., Hulshof, T., Weststrate, J. A., & Jas, P. (1992). Short-term effects of different amounts of protein, fats, and carbohydrates on satiety. The American journal of clinical nutrition, 55(1), 33-38. Willett, W. C. (1994). Diet and health: what should we eat?. Science, 264(5158), 532-537. SarDesai, V. (2003). Requirements for energy, carbohydrates, fat, and proteins. In Introduction to Clinical Nutrition, Second Edition (pp. 49-68). CRC Press.